From the breakout success of Girls Trip, Hidden Figures and Jordan Peele’s Get Out and Us to the Black Panther phenomenon, Black talent continues to shine at the box office. Of particular note are the number of Black writers, directors, and producers who have helped power these projects behind the scenes. Below, we’ve highlighted a few films that are currently in theaters or will be coming to one near you very soon. Pro tip: Make sure to keep an eye on the pages of the MSR each week for passes to free advance movie screenings. Us has been scaring audiences since March 22. Jordan Peele’s Us had a massive $70M+ debut in March and broke records for having the largest weekend gross for an original horror movie. Is the movie truly horrifying or merely haunting? That’s a matter of personal taste and much online debate. One thing is for certain: the movie is a hit! Starring Lupita Nyong’o and Winston Duke as parents fighting off their family’s evil doppelgangers, the thriller has already scared up $152M+ domestically and has solidified Peele’s growing power in Hollywood. Rated R.
Taraji P. Henson stars as Ann Atwater, an outspoken civil rights activist who strikes up an unlikely friendship with a local Ku Klux Klan leader (Sam Rockwell) as they co-chair a school desegregation summit. The film follows in the footsteps of Spike Lee’s BlacKkKlansman and Green Book in that it is based on a true story that serves as a microcosm of race relations in America. Rated P-G 13. 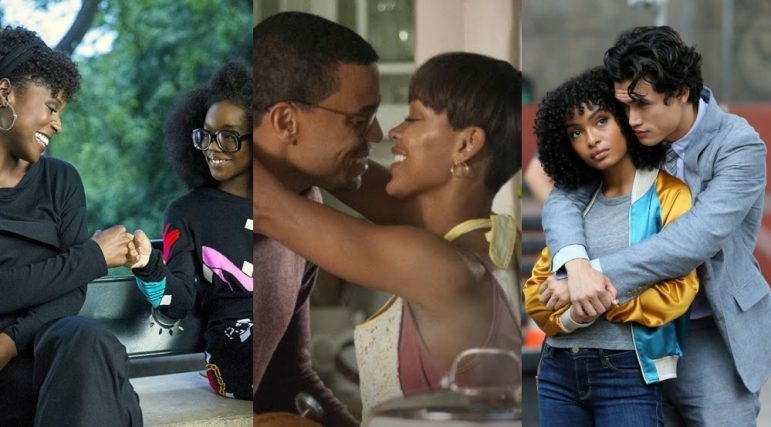 The story centers on a long-suffering assistant (Insecure’s Issa Rae) whose cutthroat boss (Regina Hall of Girls Trip) transforms into a 13-year-old girl (Marsai Martin of Black-ish). The film is based on an idea by 14-year-old Martin, who serves as executive producer — reportedly the youngest to hold such a title. Tina Gordon directs (writer, Drumline) with a story by Tracy Oliver (Girls Trip) and a screenplay by Oliver and Gordon. Rated PG. Michael Ealy and Meagan Good are no strangers to suspense-thrillers, but thankfully, Ealy is not the psychopath this time out (see The Perfect Guy). No, that distinction belongs to Dennis Quaid, whose character sells his property to the newlyweds and then proceeds to turn their Napa Valley dream home into a house of horrors. Deon Taylor (Dead Zone, BET’s Nite Tales: The Series) directs and produces. Rated PG-13. Story: Yara Shahidi (Black-ish) stars as a young girl faced with a dilemma of the heart as she falls in love right before her family is set to be deported back to Jamaica. The film is based on the New York Times best-seller from Nicola Yoon. Tracy Oliver helms the screenplay. I WAS JUST READING THE FIVE MOVIES LISTED TO GET INTO THIS SPRING, & AM WONDERING WHY ISN’T ARETHA FRANKLIN’S MOVIE/ DOCUMENTARY LISTED. ALSO WONDERING IF SOMEONE CAN SHED SOME LIGHT ON WHY ISN’T THE MOVIE PLAYING ANYWHERE OTHER THAN THE LANDMARK THEATER, WHICH IS LOCATED IN MPLS. AS MANY THEATERS AVAILABLE IN THE TWIN CITIES, I CAN ONLY FIND IT SHOWING AT THE LANDMARK THEATER. IT DOESN’T MAKE MUCH SENSE TO ME THAT EVERYONE ALL OVER THE TWIN CITIES HAS TO PILE UP IN ONE MOVIE THEATER TO SEE THIS MOVIE. JUST WONDERING HOW MOVIES ARE BROUGHT TO THEATERS, & WHOSE RESPONSIBLE FOR HAVING THEM ASSIGNED TO WHICH THEATERS.